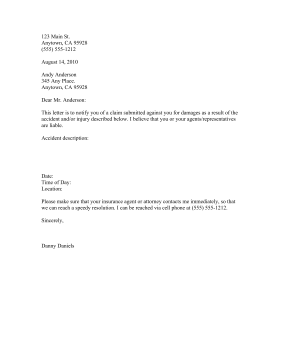 This letter is a convenient way to formally notify an insurer, agent, or individual that a claim for damages has been submitted. Includes spaces to describe the accident as well as date, time of day, and location. This letter is to notify you of a claim submitted against you for damages as a result of the accident and/or injury described below. I believe that you or your agents/representatives are liable. Please make sure that your insurance agent or attorney contacts me immediately, so that we can reach a speedy resolution. I can be reached via cell phone at (555) 555-1212.